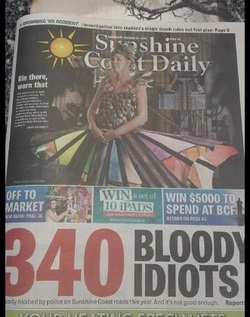 It certainly came as a surprise to discover my picture on the front page of the Saturday edition of The Sunshine Coast Daily. Great exposure for myself and the Australian Body Art Carnivale. ﻿We also had Totally Wild at our factory﻿ earlier in the year which was a great experience and I must say we were impressed with the outcome. You will find my feature at about the 13 minute mark. Click here to have a look! At the start on 2016, coffee pods were brought to my attention. This led to a mission to collect as many as I could to create a wearable art piece while making people aware of the impact it has on the environment.